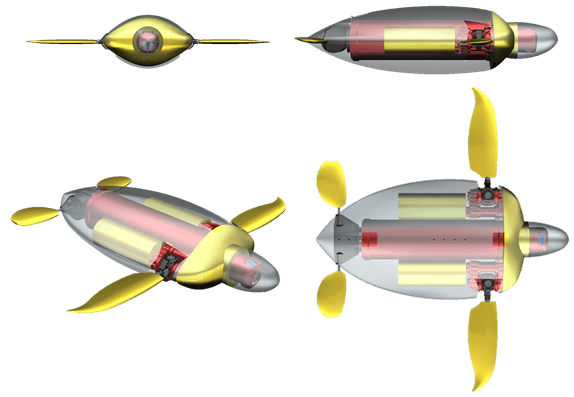 The second robot of the naro project continues the concept of fin propulsion. The natural counterpart of this robot is the sea-turtle. Also a highly endangered animal! But the reasons to choose the turtle as model lie in the rigid body which is technically much simpler to realize than a agile body of a fish. The big torso also provides enough space for sensors and batteries which are essential for autonomy. naro – tartaruga shall provide first direct measurements on energy consumption for a flapping fin mechanism in robotics. A speciality hereby is the fully 3D mechanism. All actuators, three for each fin, are in the same, waterproof body but they all still actuate the fin axle independently. Common systems use serial actuation principles where one motor drives a box with another motor which again drives the fin. This concept requires multiple sealed bodies and cables going from one to another which raises the energy consumption and risk of leakage. Another purpose of naro – tartaruga will be the development of autonomous navigation under water. The robot will be a platform allowing the use of different sensors for various tasks. Symmetric and clearly defined mechanical interfaces at the head and tail allow the exchange of modules for future research on underwater autonomy.